Government of India is implementing/developing 5 Industrial Corridors in the country, viz, Delhi Mumbai Industrial Corridor (DMIC), Chennai Bengaluru Industrial Corridor (CBIC), Bengaluru Mumbai Economic Corridor (BMEC) , Amritsar Kolkata Industrial Corridor (AKIC) and East Coast Economic Corridor (ECEC). The development of the Chennai-Bangalore Industrial Corridor (CBIC) is progressing with the completion of the master plan for the identified nodes along the CBIC. To revitalize the industries in the State of Kerala, Govt. of Kerala has proposed Kochi-Bangalore Industrial Corridor, in line with the policies of Govt. of India. also boosts the non-manufacturing sectors. The proposal gains importance in view of the competitive advantage of the Nation and the need to transform the country as a hub of manufacturing activity, through make to India program. The National Manufacturing Policy envisages establishment of dedicated industrial investment zones for manufacturing to cater to the huge domestic market and the international markets. The Industrial Corridor proposes establishment of dedicated Zones for manufacturing & promoting investments, with the intention to make the country as a hub of manufacturing activity to cater to the vast domestic markets and international markets. The project is conceived as a model Industrial Corridor with emphasis on expanding the manufacturing base in Kerala. The corridor had NF 544 as its spine and also taken advantage of the rail network and the Natural Gas Pipeline. 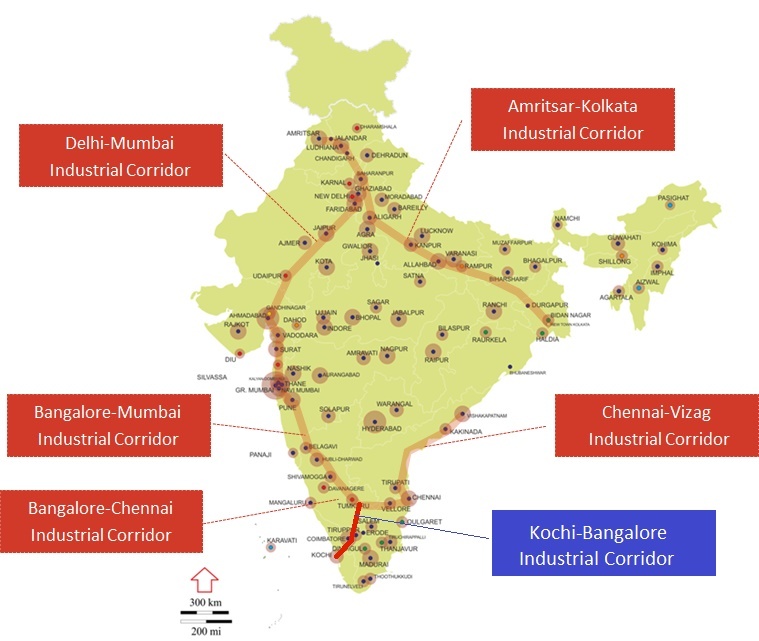 Based on reviewing the various corridor programs, KSIDC is preparing the Perspective Plan for Kochi Bangalore Industrial Corridor through the following focus areas, viz, Conducting corridor delineation, Identifying IMC location, and subsequently analyzing Industries-Urban-Infrastructure sector. The corridor has been planned to originate from Kochi and reach Bangalore via. Palakkad and Coimbatore stretching over a length of ~550 km. This proposed alignment however needs to be seen through various lenses of Industrial Development Potential, Urban Integration, Industrial Land Potential, Low Environmental Impact, Gateway Accessibility, Trunk Infrastructure Linkage, Transport Networks and Modal Integration, Support Ecosystem, Skill Availability and Infrastructure, Competing Facilities. The identification of integrated Manufacturing Cluster, Infrastructure portfolio building, growth focused industries leading to the industry vision of the industrial corridor are by formulated. The corridor would integrate at local, national and global level through industrial development, contributing to India’s growth in overall global trade. The development of Kochi-Bangalore Industrial corridor will contribute to Kerala State Vision (Perspective Plan 2030) to achieve a compound annual growth rate of 7.5 per cent in GSDP per capita for the next 20 years. Increasing the overall share of manufacturing in the GDP while leveraging the strength of existing performing sectors. Promoting green and sustainable manufacturing. Emergence of disruptive and digital business models characterized by a considerable increase in horizontal synergies across the value chains, as well as the integrated use and analysis of data forming new industries. The strategic location of Kochi with major Port and Airport, the industrial base, the existing 4 lane National Highway road connectivity between Kochi and Bangalore, the double line railways network, etc. are factors conducive for promoting the Kochi-Bangalore Industrial Corridor. Establishment of the Industrial Corridor will substantially contribute to developing manufacturing industries in the region and transform the Kochi-Palakkad region into a major manufacturing hub of South India. Once the Industrial Corridor is established, the industrial activity will be dispersed to other regions in the State, with forward and backward linkages. The Natural Gas infrastructure will also play considerable role for various applications, including power generation, heating & cooling applications in the various industries and also for process requirement in industrial units. The project will initiate a trend of reverse migration, attracting the young manpower from the State resorting to various manufacturing activities, including high-end engineering works within the State of Kerala. The project will certainly trigger the overall economic growth of the State and its employment generation on a sustainable mode.